The Montana Snowbowl Ski Patrol is a National Ski Patrol affiliated non-profit organization dedicated to providing volunteer emergency medical services to the outdoor recreational community in Missoula, MT. We are trained in Outdoor Emergency Care, Professional CPR and winter rescue and transportation. We assist the Montana Snowbowl ski area during the winter months and we also contribute our time to various off-season activities such as the YMCA’s Riverbank Run, the Pengelly Double Dip, mountain bike races, and the SOS fair. Our patrol consists of individuals young and old from Missoula, MT and the surrounding community. 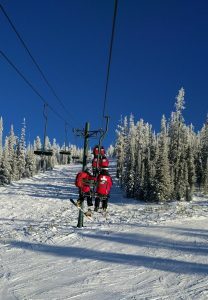 We all work in or around town during the week and enjoy volunteering our time at Snowbowl on the weekends. Skiing or riding is one of our many passions. Many of our members are both NSP certified OEC instructors and PSIA certified skiing instructors. We take pride in providing professional and courteous emergency services in rugged outdoor environments. If you wish to get in touch, please visit out contact us page.